Why are VW vented disc brakes better? Home » Auto Parts & Upgrades » Solid vs vented, disc vs drum: what are your brake options? Solid vs vented, disc vs drum: what are your brake options? We won’t pretend cars aren’t complicated beasts, and it sometimes feels like you have to be an expert just to find a car you will love. One of our favorite options in the lineup is the 2016 Volkswagen Golf GTI, and you have likely noticed that there’s a performance package (which will be standard next year) that adds larger vented disc brakes. 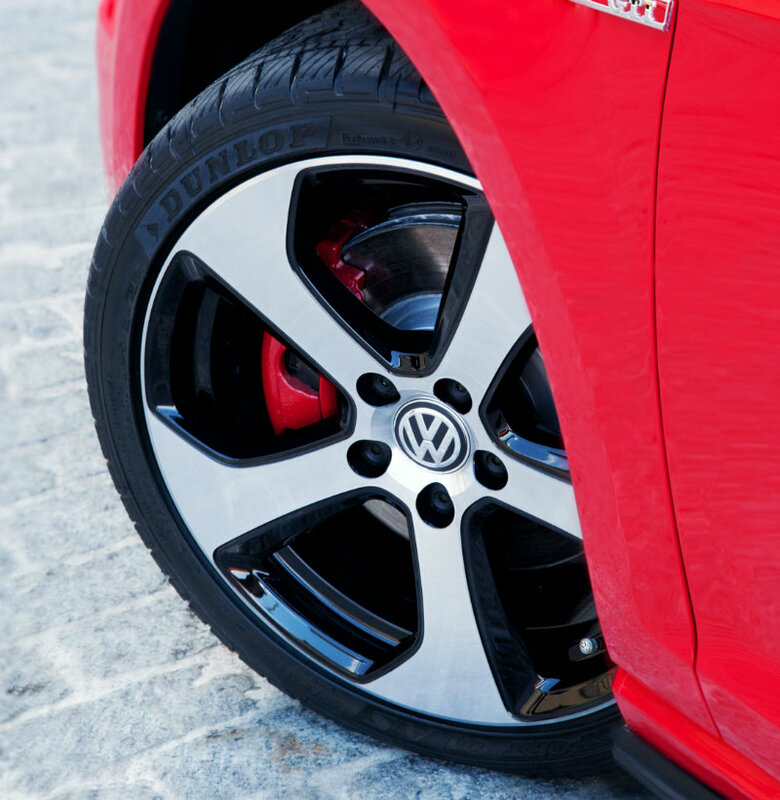 So you may be wondering, why are VW vented disc brakes better? The first thing to know is that up until the 1970s, cars and trucks used drum brakes rather than disc brakes, but then the disc brakes came out and most manufacturers slowly drifted over, first providing only front disc brakes, and eventually standard four-wheel disc brakes. Drum brakes wore down faster over time, and slowly lost the effectiveness of braking. Which is a pretty important factor in driving. Since we mentioned the GTI, it should be noted that the issue with drum fading was noticed because of performance models, where we see plenty of high-speed stopping. This wear and tear has a tendency to show flaws faster than normal, day-to-day driving conditions. If you’re wondering why many automakers (though not VW) still use rear drum brakes, it’s because most of the stopping power is found in the front end. So VW doesn’t use drum brakes, but solid disc brakes in the rear. You may be wondering what the difference is between solid and vented disc brakes. Essentially, a solid rotor tends to be used in the rear, which is again because less braking power is found in the rear. Why use a more expensive rotor when it isn’t necessary? A vented rotor typically consists of an inner and outer disc connected by ribs in between them. This setup allows them to dissipate heat faster. Since heat is the main culprit behind “brake fade” this is an important feature, and one you’ll especially find important for performance models. When you look at performance options like the Golf GTI or Golf R, you’ll notice that front and rear disc brakes are used. Though not necessary for normal driving conditions in the rear, the goal is to provide a performance option. The Performance Package increases the size of the disc brakes from 12.3 inches in the front up to 13.4 inches, and the rear ones increase from 10.7 solid discs to 12.2-inch vented ones in the GTI. This, again, refers to the size of the rotor. To cut to the chase, bigger rotors mean better heat dissipation, which is one of the main things considered when it comes to braking power. The brake pads are also squeezing the rotors at a point further from the axle, which gives them better leverage for stopping. We know this is one of the more mechanically-focused posts, and we covered a lot. Drop us a comment below if you have any more questions. Also be sure to check back here at the New Century Volkswagen Blog for more VW information. Where Can You Get Vehicle Maintenance without an Appointment near Glendale, CA? What is the Volkswagen College Graduate Program? What Does TDI Mean on a Volkswagen? This entry was posted on Monday, August 15th, 2016 at 2:01 pm	and is filed under Auto Parts & Upgrades, FAQ, VW Golf GTI. You can follow any responses to this entry through the RSS 2.0 feed. You can skip to the end and leave a response. Pinging is currently not allowed.